VOC compliant and biodegradable Castle® Grit™ features a unique blend of cleaners, safe solvents, pumice, surfactants, emollients, and skin conditioners. It effectively removes dirt, grime, adhesive, paint, tar, and grease. Skin conditioners allow it to be used repeatedly without damaging skin. 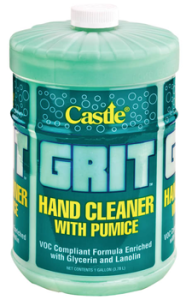 Because it is formulated with only environmentally conscious materials, Grit™ is a better product for the worker, the workplace, and the world. 1. Apply cleaner to palm of hand. 2. Rub hands together vigorously.